It was over four years ago - but still cannot forget the night I used slug pellets. Driven to absolute fury by wave after wave of nightly attacks on my unprotected seedlings, one evening I bought and spread these toxic pills. However, the next morning we rushed out to gather them up again. Then I fretted for weeks. Having spent ages encouraging thrushes and blackbirds into our garden, my pellets may now have poisoned them ! Eventually we saw a thrush, but was it the same one that always visited ? Or another, claiming the territory of one that I had killed. That I will never know, but one thing I do know. 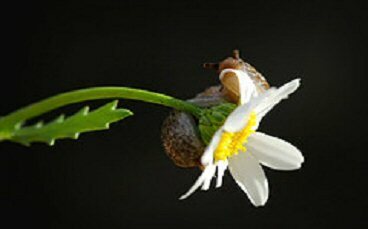 But is there anything we can do, or do we just pay the ‘slug tax’. Well, how about asking that old thing, Nature - again . Oh, O.K. 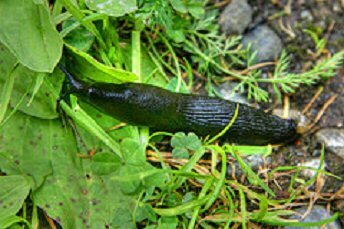 yes, slugs are one of Nature’s creatures. How can Nature help ? Well how about a little pond to encourage frogs and toads - newts too if you are very lucky. 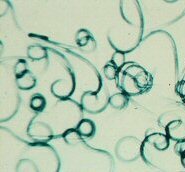 Then there are also Nematodes - they are Natures creatures too. Although some of their family we don’t like very much - our Neem really helps with their root attacking cousins. These Nematodes are tiny, tiny creatures which live in our soil and really love slugs. In the same way I really love fresh vegetables, if you see what I mean ! Well Nemasys have come up with a way of multiplying these little worms by the million, and each - it’s so easy I can do it - application lasts for six weeks. 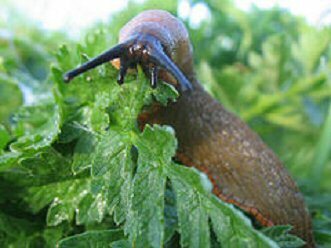 Commercial growers use them on food crops as they are totally safe, and they can be effective at temperatures as low as 5 degrees Centigrade - so can easily work all over the main slug ‘danger ‘ period between March and October. Talking of temperature, if you order these Nematodes, they do come in handy size packs but you must refrigerate them until you are ready to apply- so please don’t order just when you are off on holiday. Nemaslug comes in two pack sizes. You just water them in, but each pack has full instructions. Between March and October is generally the best time for use outdoors. 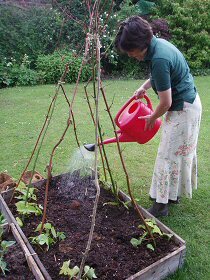 Incidentally, you may like another handy solution to protecting your salad crops. How about doing what we do and grow some inside ? This photo shows our kitchen window sill garden - just after it has just been ‘plucked’ for lunch. 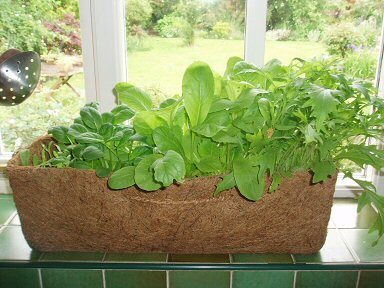 I use these biodegradable troughs for all sorts of salads and herbs - it’s so easy keeping them so near to hand. Just keep them on a surface you can wipe clean - fresh leaves and herbs really all year round !